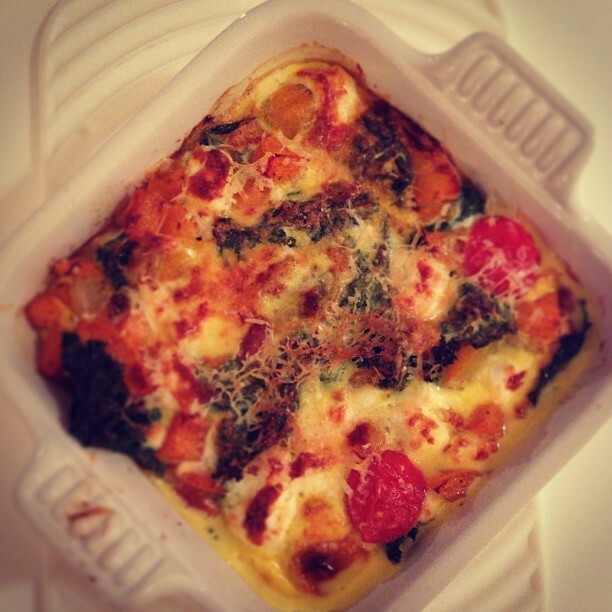 What to eat when the hubby is working late with a fridge full(ish) of veggies and eggs…baked eggs of course. Usually at around 4pm I start to think, what do I have in the fridge and what will I create with these random ingredients. Most days I’m not lazy and will venture after work to my happy place, wholefoods, but then there are days where I just don’t want to shop at all. Baked-eggs-for-dinner-tonight was one of those nights. Excited nonetheless, I started to plan…how hard could it be! Yes I know I love to cook, and have no fear when it comes to the kitchen, but really this is easy, and you can make your own variation depending on what you have in the fridge too! It’s flexible…so relax and enjoy. I had in the fridge, kale, capsicum/peppers, cherry tomatoes and feta. But feel free to use other veggies that you like. For example, spinach, zucchini, asparagus…if you can’t live without pumpkin, add in the extra step roasting them first, before starting the baked eggs! Grease a small ovenproof dish. I added some olive oil and made sure all the sides were greased and discarded the extra. Add feta to the beaten eggs (if using). Preheat the oven to 210 degrees Celsius. In a small frying pan, heat the olive oil, add the onion and cook for 3-5mins, until the onions look translucent. Once the onions are cooked, add the kale and capsicum/pepper for another 3-5mins, allow the kale to reduce. Add the kale mixture, tomatoes (and other veggies of your liking) to the ovenproof dish, mix around. Pour the egg mixture over and grate Parmesan cheese on top. Cook in the oven for 15-20mins (note, keep an eye on it, all ovens are different). To give the top a crunch, change to a high-grill for 2-3mins, once the baked eggs are cooked through.